First delivered to the USA distributor, Modern Classic Motors (owned the by famous car collector Bill Harrah, Reno, NV). Modern Classic Motors 3225 M?? Street Reno, Nevada 89510, U.S.A.
On November 18th 1975 delivered to Marque Motors, 139 W. Huntington Drive, Monrovia, CA. The new price was $ 24,100. It was repainted Metallic red/ black (Boxer paint scheme) and updated to series II specification by the dealer before original sale as specified in Ferrari Bulletin #265, 266, 267 issued July 7th 1975. Three days later sold to the first (unknown) owner. 2nd Owner: Daniel V. / Machine Shop Owner The second owner was Daniel V., owner of a Machine Shop in Santa Ana, CA. He bought the car for $ 15,000. V. bought the car from a lady whose husband had died and he said that the car was in a garage all covered in dust when he purchased it. V. was racing in the Formula Atlantic Series. 3rd Owner: Richard M. / Attorney On March 30th 1990 it was sold to Richard M., an attorney from Irvine, CA. The car had driven 17,000 miles and the price was $40,000. M., who owned several other Ferraris, had the car registered on plates “FFRRARI”. 4th Owner: William J. S. / Educator On October 1st 1992, it was sold to William J. S., an educator and trust officer from Seal Beach, CA. He bought the car for $ 26,000 with 23,997 miles on the odometer. When S. bought it, the mechanics at Francorchamps of America told him that the car was in good condition, but that it needed a major service. They performed its first major service. S. painted the car himself, completely red (red glassurit, code 330-396.4 / 30-198.3). S. has owned several other Ferraris, including two Lussos, a 275 GTB and a 365 GT 2+2. 5th Owner: Robert W. Garven Jr. Exactly 26,453 miles and two years later (yes, on October 1st 1994!) sold to its current owner, Robert W. Garven Jr., of Ventura, CA. The car is registered with plates “TIFFOSI”. After becoming part of the world famous FerrariList.com, Robert decided to start working on his car himself, and with the help of the FerrariList friends, completed a four month major service in July 2000. In 2001 he completely restored his AC/heating system and completed a major suspension overhaul. In 2002 he replaced the clutch. His life’s ambition is to make this Ferrari the best that he can and he really enjoys working on this fine piece of Italian machinery! Robert was the drummer of the famous heavy metal band “Cirith Ungol”. 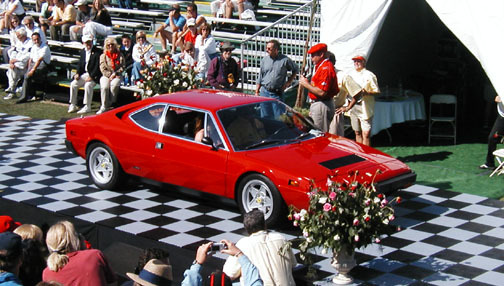 In the second photo above - taken by the Webmaster at Concorso Italiano 2004, in Monterey, CA. - Robert and his wife accept a Silver award in the Cavallino Classic Concours, held during the Concorso Italiano event.